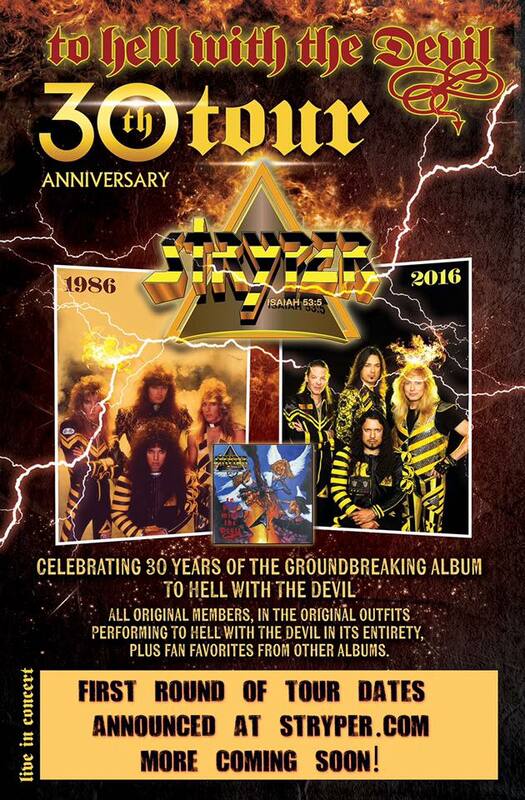 Iconic rock band Stryper will celebrate the 30th anniversary of their multi-platinum album "To Hell with the Devil" this fall with a world tour, featuring all four original members and complete with the original yellow and black costumes. Oct. 09 - Dallas, TX - Gas Monkey Live! Released by Enigma Records on October 24, 1986, the Grammy-nominated To Hell with the Devil is the band’s third studio album and the first Christian metal album to achieve platinum status. It remained the best-selling Christian metal album until P.O.D. 's Satellite in 2001. Throughout 1987, the music videos for "Free" and "Honestly" ranked #1 on MTV’s list of most requested videos, and the video for "Calling on You" reached #2. Stryper was the first band to ever have two songs in MTV’s Top 10 simultaneously. "Honestly" was the biggest single from the record peaking at #23 on Billboard's Hot 100 Singles Chart. The album was listed at No. 88 in the 2001 book, CCM Presents: The 100 Greatest Albums in Christian Music. The album was the only heavy metal album on the list. Ian Christe, author of the heavy metal history book Sound of the Beast: The Complete Headbanging History of Heavy Metal (2003), mentions To Hell with the Devil in his book as one of the landmarks of the glam metal movement. In 2010, HM Magazine listed To Hell with the Devil No. 3 on its Top 100 Christian Rock Albums of All Time list stating that "when this album broke, it went multi-platinum, forever raising the ceiling of what heavy Christian music could do." Heaven's Metal fanzine ranked it No. 6 on its Top 100 Christian metal albums of all-time list. The original cover of "To Hell with the Devil" caused a torrent of controversy, and was soon changed to an all-black design. The original artwork depicted four long haired angels throwing the devil into a fiery pit. The cover was then changed on later pressings to a basic black cover with the Stryper logo and the album title in the center. Unlike many of their counterparts, Stryper is comprised of all four original members with Michael Sweet on vocals and guitar, Robert Sweet on drums, Tim Gaines on bass and Oz Fox on guitar. Rocking since 1984, Stryper is responsible for such classic '80s metal albums as Soldiers Under Command, To Hell with the Devil and In God We Trust. After a sabbatical for much of the 1990's, Stryper returned strong in the early 21st century. To date, the Dove Award-winning and GRAMMY-nominated band has sold over 10 million records worldwide.